Let’s say you step into an elevator, push the button for the 10th floor, watch the doors slide shut, and cast a quick glance at the other passengers in the car. Lo and behold, you spot one of the Koch brothers! No, it’s the CEO of ExxonMobil! Or the CEO of TransCanada, the outfit behind the Keystone XL pipeline! Or maybe it’s President Obama himself! You swallow hard. This is your one and only chance to say in 30 seconds why you care about tackling climate change. What would you say? Perfecting your elevator pitch is considered a key element in landing a job or making a sale. No doubt it’s also a basic skill behind speed dating, though personally I wouldn’t know about that. But even shorter than an elevator pitch, and sometimes as challenging to craft, are slogans, those pithy messages that you see on banners at a march or rally. 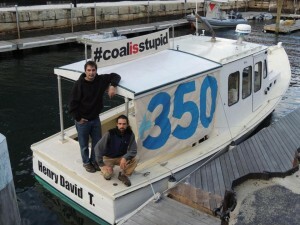 Here is a question that beset me this spring: if the Diocese of Western Massachusetts were to create a banner to bring to climate rallies, what should the banner say? I came up with several possibilities and ran them by focus groups that consisted of 1) my husband; 2) the Bishop; 3) the Communications Director; 4) the Social Justice Commission; and 5) the diocese’s new Creation Care group on Facebook. Although my research was neither systematic nor extensive, it was great fun to carry out and it generated vigorous debate. Before long a winning slogan emerged. Our diocese’s new banner will say: Love God, Love your neighbor: Stop climate change. To me it makes perfect sense to link stabilizing the climate with loving God and neighbor. We express love for the Creator when we tend and safeguard the living world that God entrusted to our care. We express love for our neighbor when we work to stop climate disruption, which would devastate food supplies, cause flooding, intensify drought, spread disease, create refugees, and trigger violence and social upheaval. We have our marching orders: love God and neighbor. We have our banner. 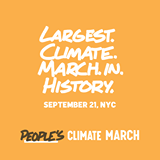 We’re all dressed up and we have a place to go: to New York City, on Sunday, September 21, when people from across the country will participate in what promises to be the biggest climate march in American history. Ban Ki Moon, United Nations Secretary-General, has summoned international leaders in government, business, finance, and civil society to New York that week for the 2014 U.N. Climate Summit, as part of a global effort “to mobilize action and ambition on climate change.” The People’s Climate March intends to amplify the urgency of that message, as tens of thousands of people who care about our planet’s future take to the streets of New York in a dignified, family-friendly, high-energy and historic march. According to organizers’ current plans, people of faith will march together. I like to imagine that lively crowd and its colorful tapestry of diverse religious symbols, vestments, and banners. I like to imagine the sight of banners held aloft from various churches in our diocese. I like to imagine the joy of walking alongside countless Episcopalians and other Christians, and alongside countless Jewish, Muslim, Buddhist and Hindu men, women, and children as together we bear witness to our shared faith in the goodness of life as it has evolved on this planet. Yes, this event takes place on a Sunday afternoon. What shall we who are Christians as well as those who may pray in other ways do about Sunday morning worship? Maybe clergy and members of your congregation can share prayers and a simple Eucharist as you ride the bus to New York City. Maybe your church can hold a special send-off worship service the night before. Maybe you can ask your church to pray for you on Sunday morning as you and other members of your congregation head out to the march. As I imagine us walking through the streets of Manhattan, I can already sense our common commitment to protect and heal the global atmosphere upon which all life depends. And let’s face it: along the way we’ll have plenty of time to perfect our elevator speeches. Here’s the last thing to say about our banner: like Jesus’ mission of mercy, justice, and compassion, and like the climate movement itself, the banner is too big for one person to carry. Close to eight feet long, our banner needs at least two or three people, maybe more, who can hold it high. Will you join me in taking a turn at carrying our banner? Love God, love your neighbor. Let’s stop climate change and head to New York. • To sign up for the People’s Climate March, click here. You will receive updates as plans for the march come together. You can also follow People’s Climate March on Facebook. • To ride one of the buses heading from your area of Massachusetts to New York City, sign up here. • If you would like your church to follow the example of other churches by asking your Vestry to endorse the People’s Climate March, and if you would like me to send you a sample Vestry statement, please drop me an email (mbj@revivingcreation.org). • If you are a member of the Diocese of Western Massachusetts and would like to join our Creation Care group on Facebook (which is by invitation only), please drop me an email (mbj@revivingcreation.org).